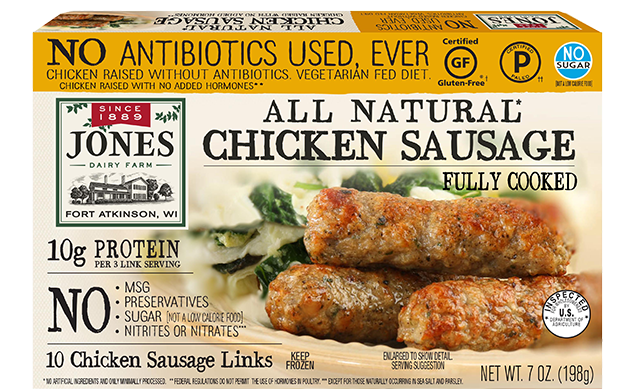 Eat clean with great-tasting antibiotic- and sugar-free chicken sausage links from Jones. There's a lot to love about our all-new chicken links. With all-natural, great-tasting ingredients—like vegetarian fed, hormone-free poultry—there's no need for additives like sugar, MSG, nitrates or artificial flavors. Certified Paleo and Gluten-Free, each three link serving of clean-label sausage delivers 10 grams of protein and just 5 grams of fat. Place chicken sausage links in preheated skillet with water (3 tbsp. for frozen or 2 tbsp. for thawed) over medium heat for times shown, or until heated through. Turn occasionally for even heating.